PARISH – The Altmar-Parish-Williamstown High School Athletic Department held a letter of intent signing ceremony for Jordan Mull who has committed to play Division II football for the American International College Yellow Jackets in Springfield, Massachusetts, next year. 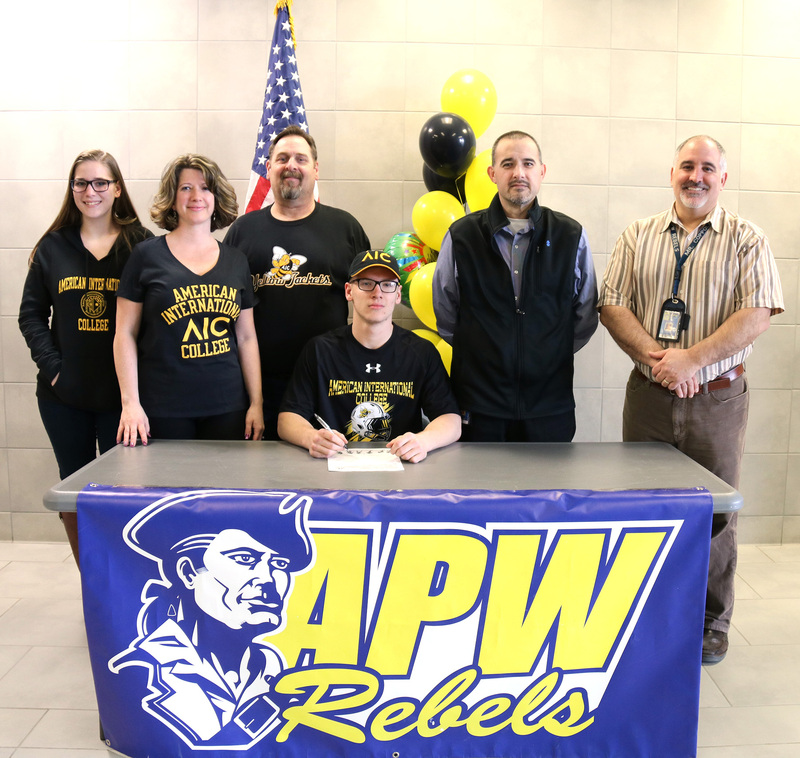 On hand the for the letter of intent signing ceremony was Jordan Mull, seated center, along with his family from left: Lauren, his sister; Jordan’s parents, George and Sherri Mull; Varsity Football Coach Scott Stanard and APW Athletic Director Jamie Coppola. Mull set several records as a running back for the Rebels during his senior year at APW, including yards rushing in a single game: 491; and single game touchdowns: seven. Stanard said the Rebels looked to Mull for his leadership this season saying, “He was a work horse all season long.” Stanard went on to call Mull not only the team’s offensive leader, but also noted that he did a great job on the defensive end as well. “I’m really proud of how he found a school that he fit with,” he said, adding that he can’t wait to get his schedule of games so he can go watch him play. Mull will major in Graphic Design at AIC. His family was on hand for the special signing ceremony.